Charter school backers rallied on Boston Common by the State House. Hundreds of parents, educators, and students marched across Boston Common Wednesday morning and rallied near the State House to demand that legislators ease limits on the number of charter schools. 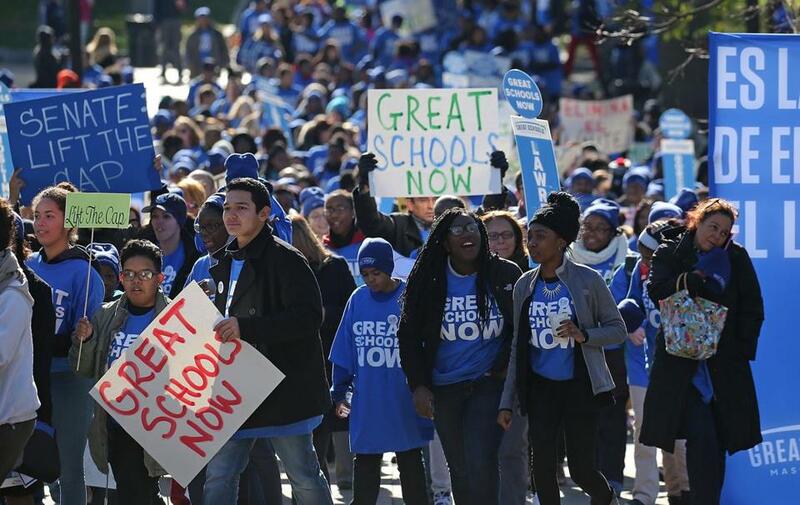 The rally was organized by Great Schools Massachusetts, which supports passage of Governor Charlie Baker’s bill that would allow 12 new or expanded charter schools each year in districts performing in the bottom 25 percent on standardized tests. Such districts include Boston, Fall River, New Bedford, Randolph, and Salem, as well as Holyoke and Lawrence, which are under state receivership. The governor’s expansion plan mirrors a separate ballot measure filed by a pro-charter group, but his bill adds further changes to current law. Baker, who was traveling, sent a video message exhorting the crowd to embrace the hard work he said would be necessary to lift the cap. “We need to make sure that these schools — these great schools — are available to everyone across our great state,” she said. Proponents of charter schools — public institutions that often operate outside local districts — say they must expand to serve 37,000 children statewide who are on waiting lists. They face opposition from teachers’ unions and many parents who oppose the schools in part because most are not unionized and because they divert thousands of dollars in state aid from district budgets for each student they enroll. Even before it happened, Wednesday’s rally had been scrutinized by opponents of charter school expansion. The president of the Boston Teachers Union filed a complaint with the State Ethics Commission alleging that some charter schools broke state law in using school resources to recruit parents to attend. The Massachusetts Charter Public School Association disputed the claim. Another group that opposes lifting the cap, the Massachusetts Education Justice Alliance, urged legislators Wednesday not to succumb to pressure. “Local communities have no say over whether a charter school is opened in their community and no oversight over charters once they are opened,” said Russ Davis, a spokesman for the alliance, in a statement. The meticulously orchestrated rally included several logistics coordinators speaking into earpieces as they guided the crowd across the park. Rosa Dixon of Charlestown told the crowd that her daughter attends a traditional Boston public school where she is in danger of falling behind, while the first-grader sits on waiting lists for four charter schools.